Electricity is something we often take for granted when living in a stationary home or in an RV on a campground. In state parks or other remote areas, however, a portable generator might be your only source of power. 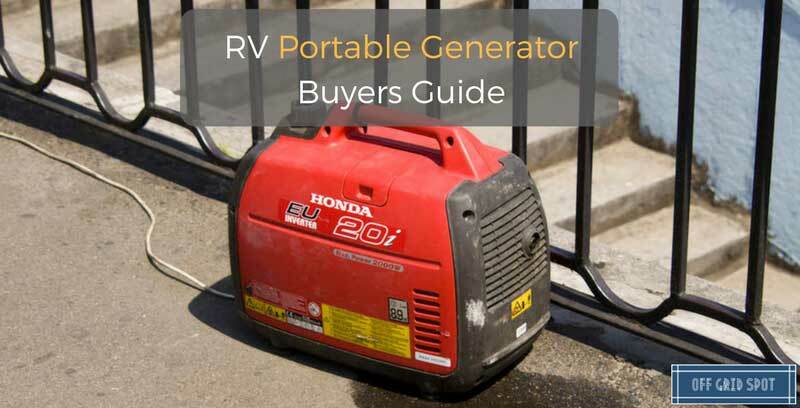 There are a lot of choices, but the best portable generator for RVs is one that meets these criteria: it provides enough power for your needs, it’s quiet, and it’s portable. What each of these means will change depending on your personal needs, though, so let’s look at the several factors that can help you choose. The portable inverter generator comparison chart below will give you a birds eye view so you can quickly see which motorhome generator is the right fit for you. Scroll down to read individual reviews of each generator..
You should probably avoid just going and picking up any nice-looking conventional generator you can find. While they are cheaper and provide a lot of power, the racket they kick up won’t make you any friends—and many campsites won’t even allow generators that are past a certain decibel level. They also tend to be bulky, heavy, less fuel-efficient, and poor choices for charging sensitive electronics. Inverter generators are the answer to most of those problems. Specifically designed to be quiet, these generators are often smaller and lighter than their conventional counterparts—though you can get a heavy-duty one if you want to. You’ll also get more mileage out of your fuel, as many of them automatically adjust how much power they produce based on how much you're using. Conventional generators, on the other hand, just run at the same level all the time, often producing more than you need. A final perk: inverter generators produce better-quality power, meaning that they generate a smooth current with less than 3% “total harmonic distortion” (THD), which is important for modern electronics. Charging your devices with uneven power can damage them, so if you routinely use a laptop, smartphone, or smart TV, an inverter is essential. Gasoline is the most popular fuel type for RV generators, as it is a very common fuel. You need to be careful about transporting it--maybe don’t store it in your RV, as even gasoline fumes can be combustible—but with proper precautions, you can bring along as much as you need. Propane is bulkier and harder to find, but it is definitely safer to transport since it is stored in metal tanks. Not as many generators are designed to run on this, but it’s environmentally friendly and lasts longer, so it’s a good choice for infrequent travelers who don’t anticipate needing many refills. This is the first question you should ask. If you don’t know the answer, don’t worry! You’ll just need to read a few labels and do some addition to figure it out. Typical inverter generators produce between 1,000 and 4,000 watts, with 1,000 being enough to power some lights and small appliances, and 4,000 being enough to run just about everything. To see how much you need, just check the wattage of the things you plan to run and add the numbers up. Some appliances measure their power consumption using volts and amps instead of watts, but you can easily convert it using this equation: volts x amps = watts. The first thing you’ll want to look at is the air conditioner—usually an RVs biggest power drain. A typical 12,000 BTU unit (mid-size for an air conditioner) will draw around 2,000 or more watts to start and will need 900 or more watts to stay running. Make sure you look at both the starting and the running wattage, because if your generator isn’t powerful enough to start it you’ll be out of luck. If you find yourself needing more than 4,000 watts of power, don’t worry—most inverter generators can be hooked up to work in parallel, meaning that they can be wired together to make one generator. Generally, however, they need to be the same model or brand. What does it mean if a generator isn't RV Ready? Some of the generators we review here will need an additional adapter to be able to connect to your RVs hookup. Both the Honda and Yamaha options on this page come with a regular 120-volt 15 amp outlet, just like the one's you'll find in your home or inside your RV. You will need to purchase a 30 or 50 amp adapter cord​. So how do you know which adapter cord you need? Easy, if your RV hookup cord has 3 prongs, it's a 30-amp, if it has 4 prongs, it's a 50 amp. With modern inverter generators this typically is not much of a problem, but if you are planning on being around other campers you should look for generators that are rated 60 decibels or below. That measurement is usually done from a distance with the generator running at a 25-50% load, so it doesn’t really indicate maximum noise potential, but it does give you a good way to compare noise levels between generators. Almost all inverter generators, especially those meant for RV use, are below this threshold. By comparison, the bigger conventional generators typically put out 65-85 decibels. 85 dB is getting pretty close to rock-concert levels. Depending on how frequently you move and/or how much you think you can lift, this can be an issue. Generators definitely aren’t light—they range from 30 pounds at the very lightest up to 150 pounds, with the average being around 85 pounds. Many of them have wheels built in, but you still have to load and unload it. This is where inverter generators start to look less attractive. A midrange 3,000-watt generator costs an average of about $900, with lower-end models costing as little as $500 and high-end ones hitting $5,000. Don’t be tempted to cheap out, though—a generator is an investment that can keep going for a long time. You’ll save yourself time and money by buying one that has a good reputation for reliability as opposed to a cheap one you’ll have to replace eventually. Each one of the factors above may need to be considered before you decide on what is the best generator for RV use and your particular setup. The Champion portable inverter is explicitly designed for RV use, and you can feel that when you install and use it. This is a gasoline-powered generator with a maximum wattage capacity of 3,100 watts. In real-world usage, you can expect a running wattage of 2,800 watts, which is enough to power a lot of appliances in a mid-sized RV. It is not the lightest generator out there, but the installation process should not be too hard. The device has a very compact shape, and the inclusion of ergonomic handles and durable wheels improve it’s mobility considerably. The main highlight in this Champion is the remote start capability. Using the wireless keyfob, you can start this generator from afar. The range of the remote is around 80 feet. If you don't want to use the remote, a convenient control panel offers full accessibility to all the critical buttons in a single Quick Touch Panel. This generator has a healthy THD level of under 3%. If you want to run a lot of sensitive electronic devices like laptops, this generator is a safe choice. Connectivity options are available aplenty, with both RV (single, 30 amps) household (two 20 amp) on the generator. Along with these 120V AC outlets, there is also a 12V DC charging port, with two USB adaptors. The noise levels of the Champion range around 58-60 decibels, which is good enough for recreational use. The 1.6-gallon fuel tank is large enough to give 8 hours of continuous operation if you run the generator at 25% capacity. Those are decent fuel efficiency figures. The generator does have a few issues with cold start, and sometimes neither the remote nor the electric start feature seems to work. In cold weather, you will have to choke it manually. The overall build quality is not premium, and bits and parts will degrade pretty quickly. Taking all this into account, this might not be the best unit for heavy users. Honda is a firm favorite among RV users and for a good reason. The Japanese company is renowned for their smooth and reliable engines. The unit powering this compact inverter is a 120cc four stroke engine capable of generating 2200 watts of peak power, and 1800W of continuous load. If you want a bigger power output, you can link a pair of EU2200i in a parallel configuration. If you're going to run an AC, you will have to opt for that instead of a single 2200 unit. You don't necessarily need them to be the same unit, as the EU2200i is capable of running alongside older 2000 series units from Honda. The noise levels were the lowest among all the units we tested, returning decibel levels of between 48 and 57dB depending on the load. You can expect a maximum running time of 4 hours on max power, and with lower loads, the runtime should reach as high as 9 hours. The Honda unit is very compact and perfect for use in an RV. The build quality is top notch, and the parts are of high quality. The fit and finish levels are excellent as well, with the outstanding bullet-proof reliability that Honda products are known for. The Honda EU2200i is the latest in a lineup of portable inverters with a reputation for fuel efficiency and reliability. And this compact unit does live up to the billing. There are no significant issues with this generator. Sure, it is a bit small and not capable of running heavy appliances like your AC. But that is not a design flaw, just the limitations of a small inverter, Overall, this is an excellent RV generator. This Yamaha is a small RV inverter generator ideal for emergency backup use. At peak power of just 2000W, you will not be able to run a lot of appliances simultaneously. But if you do need extra wattage, the Yamaha design allows for parallel operation: you can link up two EF2000iSv2 inverters to deliver 30Amps of power. Another great feature on this inverter is the smart throttle feature. It can sense peak RPM requirements and make adjustments on the fly, improving fuel efficiency figures considerably. The 1.1-gallon fuel tank can keep this generator working at 25% capacity for over 10 hours, which is a fantastic figure for such a compact device. It weights under 50lbs and is small enough to fit anywhere on your RV. With a generous dose of rubber damping, the Yamaha inverter operates at around 50-51 decibels. Even at peak loads, the noise level rarely crosses the 60Db mark, which is not surprising for such a small 79cc single cylinder engine. Many generators face starting trouble, especially in cold weather. The Yamaha engine has optimized auto decompression and auto warming systems in place to make cold starts painless and smooth. As usual, all the essential controls are available in a central location. The power outlets include a pair of 120V AC outlets and a single 12V DC outlet, which is sufficient for a device of this size and capacity. Heavy use will lead to frequent issues, as this generator is not decided to handle constant loads. Oil consumption is pretty steep for a small device, and you can expect low oil shutdown after just 10-12 hours of use. Yamaha support is also often not up to the mark. The generator may face many minor “niggles” which the Yamaha support does not seem to cover. This Yamaha is recommended if you want a backup device that will not see heavy or constant use. The second inverter from Champion on our list tries to outshine the competition by using a dual fuel system. You can run this inverter using either gasoline or propane. This basically doubles your fueling options, which can be boon when you are on the road. It uses a propane adapter to achieve this capability. As far as power figures are concerned, the 192cc engine is capable of delivering a peak power output of 3400W, and 2790W of running power. This is enough for running more than a few appliances, including a small AC. Due to the larger capacity engine, the noise levels are slightly on the higher side, though not unpleasantly so. With clan power on offer (THD under 3%), the inverter can be safely used for digital devices and laptops. You get 120V AC RV and household outlets, along with a DC outlet and USB adapters. So this inverter offers several plugging options. When on gasoline, the inverter can last for a maximum of 7 hours on low power user settings. The gasoline tank has a capacity of 1.6 gallons. If you want to run this on propane, the system comes with a propane inlet and hose for that purpose. The inverter is easy to start and comes with push-button electric start controls. The noise levels can be a minor inconvenience, especially on campsites with neighbors close by. The fuel efficiency figures are not the best, and the unit does suffer a lot from overloading issues. The electric start battery also tends to run out of juice pretty quickly, which can be very frustrating if you are in the middle of your camping trip. With a peak rating of 4500W, the iGen4500 is the biggest inverter for RVs on our review shortlist. This is also the biggest unit we have reviewed so far, with a stated weight of around 90lbs. With a slew of advanced features, the iGen4500 also happens to be the most high-tech unit here. The inverter has a continuous power rating of 3800 watts, which is higher than the peak rating of the next best competitor reviewed above. You get both electric push-button start and a remote key fob, which makes starting the unit a breeze. The fuel tank on this unit is also massive, with a 3.4-gallon capacity which is easily double that of smaller inverters. At 25% load, you can expect this inverter to last for 18 hours. No other unit comes close this figure. The control panel is also very impressive, with an LED panel displaying info like fuel level, power output, and voltage. Despite those impressive power figures, the noise figures are kept to a very low 52dB (at 25% load), thanks to the 224cc Westinghouse engine inside. Power outlets onboard include an RV outlet (120V AC0, two household outlets (120V 20Amp), and a pair of USB outlets. This digital RV inverter delivers safe and clean power for your electronic gadgets. The Westinghouse digital inverter is a powerful high-end option. So it is rather expensive, but the asking price is justified by the features and overall reliability of the unit. The large gas tank makes it a bit bulky. 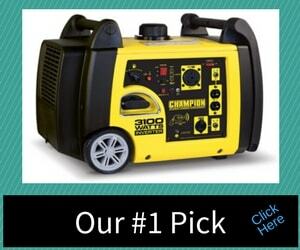 Though each of these generators has something different to offer, my favorite for all-around RV usage at a good price is probably the Champion Power Equipment 75537i. It supplies enough power to fill most of your needs, comes bundled with some neat features (remote start is really handy to have), and is reported to be quite reliable by most of its users. The 75537i runs on gasoline, so fuel will be plentiful—if you want a similar version with the propane option, you can always try the Champion 100263. Though it can get loud, under normal use it stays at a very reasonable volume. 95 pounds is actually quite a reasonable weight for this power class, and the wheels, while they make hauling the generator around a little awkward, work just fine. While all the generators above suit different needs and different budgets, you’ll have a hard time finding a situation where this one won’t do the job.